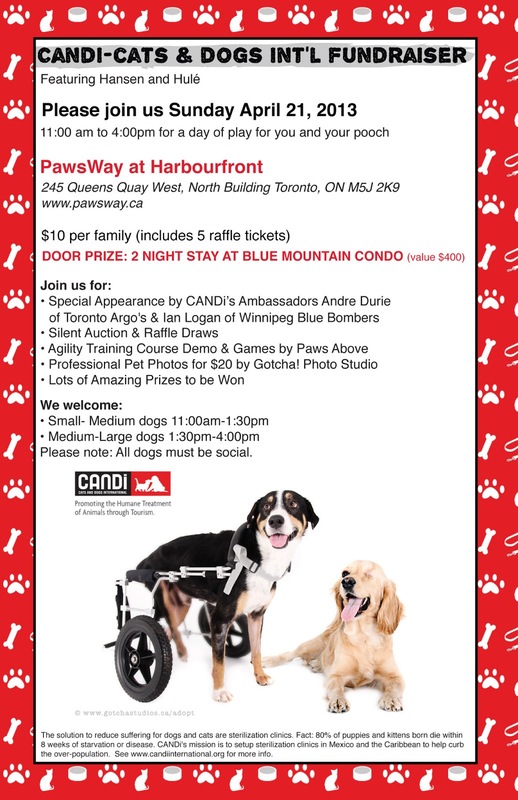 Toronto Dogs Directory: Cats AND Dogs International (CANDI) Hosting "Spay It Forward" Fundraiser At Pawsway - Amazing!! Cats AND Dogs International (CANDI) Hosting "Spay It Forward" Fundraiser At Pawsway - Amazing!! Cats AND Dogs International (CANDi) is a registered 501 (c) (3) non-profit organization working to save lives and solely relies on private funding to establish spay/neuter clinics and setup education and adoption programs in key tourist destinations that have struggling economies. Through their programs, they have saved thousands of animals who would have otherwise starved to death, been inhumanely euthanized, and endured desperate lives of suffering. In order to fund CANDi’s next Sterilization Clinic in November 2013, CANDi is holding a “SPAY IT FORWARD” Fundraiser on April 21, 2013, from 11:00am to 4:00pm, at PawsWay, 245 Queens Quay West, Toronto, $10 per family and featuring Hansen AND Hule (pronounced Oolay), two dogs saved by CANDi. wheeler to get him around. HULE was viciously attacked with a machete last year and through the efforts of CANDi, she received immediate emergency surgery. Although she lost an eye and suffered other neurological damage, little Hulé was saved. Hulé was brought to Toronto to undergo rehabilitation and is now walking, wagging her tail and has a forever home. This innocent little dog’s strong will to live has impressed many people and her story has received international press coverage. There will be a special appearance by CANDi Ambassadors Andre Durie, Toronto Argonauts, and Ian Logan, Winnipeg Blue Bombers. There will be lots of great prizing to be won at our Silent Auction and Raffle Draws, Agility Course Training, and professional pooch photos for $20. All proceeds going to support CANDi’s next spay/neuter clinic in Mexico, November 2013. CANDi’s programs, to date, have focused in Cancun where they have sterilized more than 8,000 cats and dogs. CANDi’s work has attracted help from organizations like RIU Hotels & Resorts and celebrities such as actor/comedian George Lopez, who helped to fund the recent clinic in honor of Richard Pryor, the late comedian’s wife, Jennifer Lee Pryor, and her organization Pryor’s Planet. FACT: There are approximately 500 million dogs globally, 75% of which are strays. 80% of puppies die of starvation or disease within 8 weeks of birth. The numbers are similar for cats. In countries without resources, these unwanted animals die of starvation or disease on the streets – or are killed inhumanely to control their population. Go to www.candiinternational.org for more information or to find out how you can help. ***Event organizers are also seeking donations of items for the raffle and baked goods.